The topic of “Forgiveness” is also the center of Wendy’s second book, “The Preacher’s Daughter: A Memoir.” Her consulting and coaching practice. Personal Services Plus (PSP), consults and coaches its clients by helping them organize their affairs to achieve their overall goals. At Women on the Move Network, we honor women whose heroism and visions have brought both change and prosperity to others in every community. This month, along with the People for Peace and Prosperity, we held an event for the Third Annual International Day of Women Celebration. This year, we recognized the Time for Change Foundation and its founder, Kim Carter. 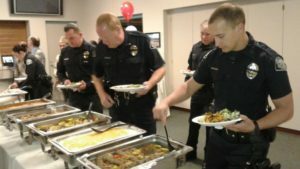 Upland, CA – On Feb. 24th, Upland Baha’i Community hosted an Appreciation Dinner event for their police force. It was an added blessing this year, to be able to honor and serve this body of peacekeepers during the first day of the Baha’i Ayyam-i-Ha celebration.